Fifty boats are now hard on the wind in Buzzards Bay or just reaching the Atlantic Ocean. 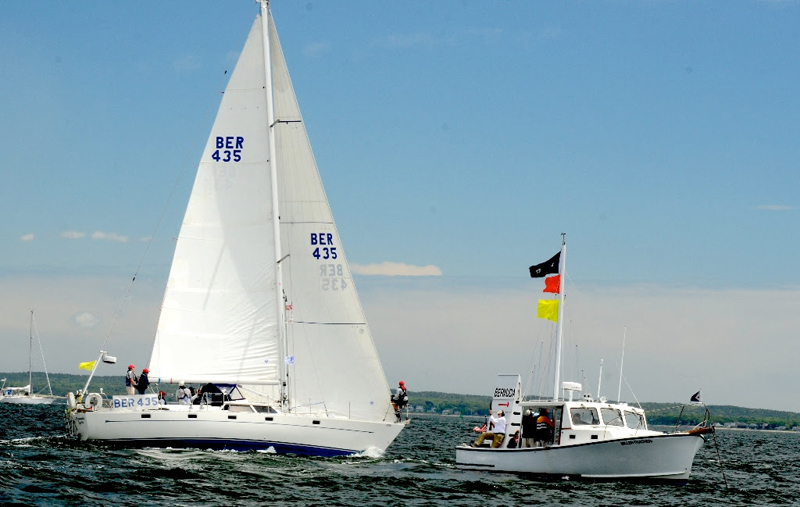 They are racing from Marion to Bermuda in the 40th Anniversary of the Marion Bermuda Race. This classic ocean race is always a challenge. Paul Hubbard skipper of ‘Bermuda Oyster’  the only Bermuda boat in this year’s race got off to one of the best starts of the day leading the 12 Class D entries over the line the second of four starts today. Hubbard has a crew of regulars aboard— Barbara and John Ashfield from the UK. Steve Musicant, Stephen Benn and Royal Hamilton Amateur Dinghy Club [RHADC] Commodore Neil Redburn, and new crew member Scott Snyder from Denver, Colorado. The race got off to a good on time start with a building southwesterly breeze that was about 8kts for the first start at 12:10 EDT for the slower Class D Boats. Winds built to a sunny 15kts by the time the fastest A Class boats got off at 12:55. Only one boat, the Class C Morris 46 ‘Escapade II’ skippered by Tom Bowler pushed the line and was over early. He had to turn back to re-cross the line. That’s not a happy way to start a 645 nautical mile ocean race. The scratch [fastest] boat ‘Jambi’, a new Hinckley Bermuda 50 skippered by John Levinson should reach Bermuda by late Monday but that depends on where they park and for how long on the sail to Bermuda.